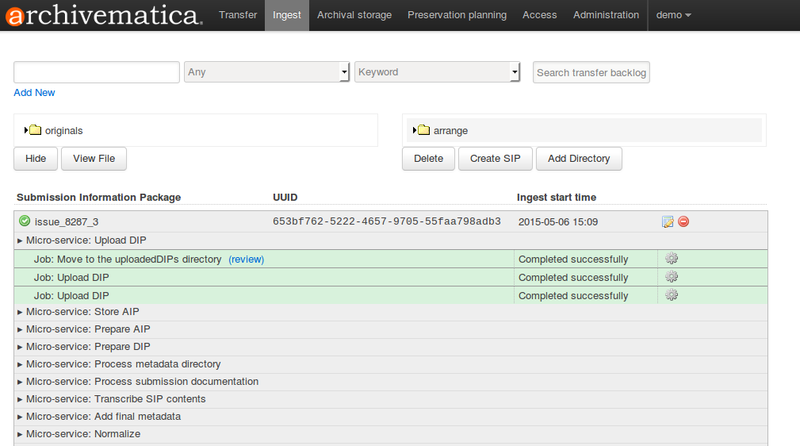 In Archivematica version 1.4, direct upload to CONTENTdm is no longer available. The process described below assumes the user will use Project Client to upload DIPs to CONTENTdm. If there are both Dublin Core and non-Dublin Core fields in metadata.csv, Archivematica will look for “custom” (non-Dublin Core) field names in the metadata.csv file file and create a tab delimited file based on those fields. This allows the operator to use the field names as they appear exactly as they do in the CONTENTdm collection, which eases the field matching in Project Client. It is also recommended that you enter the non-Dublin Core fields in the same order as in your CONTENTdm collection. However, if metadata.csv contains only Dublin Core namespaced fields, Archivematica will create the tab delimited file using those fieldnames, stripping out the dc namespace. For example, dc.title will become title.